On Thursday -- shortly before the Japanese government released new statistics showing the nation's centenarian population has reached an all-time high of more than 40,000 -- researchers from the National Institute of Advanced Industrial Science and Technology (AIST) unveiled a new humanoid robot designed to lead the elderly in physical exercises. 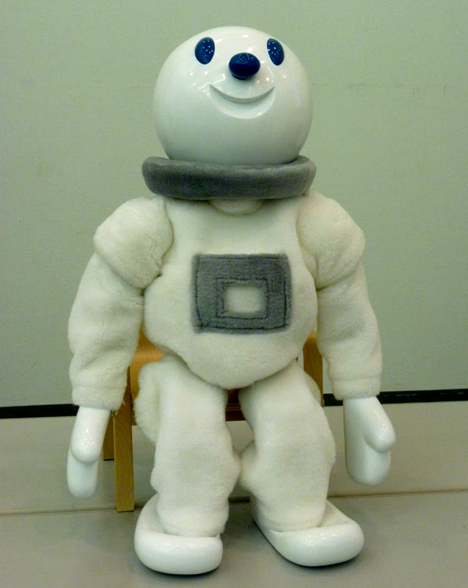 Dressed in a velvety space suit and sporting a goofy grin, the 70-centimeter (28-in) tall robot, named "Taizo" (a play on the word "taisou," which means "calisthenics"), has a friendly appearance designed to motivate elderly people to engage in more physical exercise. With 26 joints in its body, the 7-kilogram (15-lb) mechanical exercise instructor can smoothly demonstrate around 30 different moves for others to imitate. Although Taizo does most of its exercises while sitting in a special chair, it can also stand up to perform some activities. Taizo can operate for about two hours on a single charge, and it has very basic language skills -- enough to understand simple spoken commands and lead a group in exercise. The developers plan to start selling (and renting) the robots next year for around 800,000 yen (approx. $8,000) each. Ah, Taizo. I've seen this somewhere else, but I can't for the life in me work it out. I don't really know what to make of it, especially with that price tag. I can already hear the critics saying that Armies of Taizos will take over the fitness training world and replace all of the personal trainers. Naw. Whatever works in getting people to move.